The best 4K video editing software for you with powerful tools. With the popularity of 4K Cameras, it is time to use a professional video editing software for handling your delicate 4k video footage. There are countless software options for video editing, but not all are created equally. And importantly in current times, many do not yet have support for 4K editing. Don't be left behind - below you will find ten of the best and most trusted video editing applications that do support 4K videos; as this technology becomes more widely used throughout the film making community. Whenever you choose a video editing software, you should always consider if your computer meets the requirements for installing and using a professional video editor, as well as the usability of the video editing software and your budget. We have listed these factors below for your quick check. And in this top 10 list of best video editing software, we have picked up both free 4K video editing software and paid 4k video editor for you to choose. We have listed the top 10 best 4k video editing software for beginners and professional based on its features, pros, cons and price. Let's check it in details. The latest version 9 of Filmora video editor is the stripped back, simpler option for video editors who do not want the complexity, advanced features and extra cost of the professional video editing software. It features an interface that has been created for ease of use, but there is also the option to select between Expert or Quick editing modes; depending upon your skill level and needs. Cool effects include the particularly interesting Hollywood style effects, sound effects and stunning templates. Other interesting and new features include the Green Screen and Scene Detection options. The software can also automatically fix the footage with lighting or color issues which can result in a much more polished end result. The newly added Action Cam tool allows you to merge, cut and edit 4k videos shot by your action cameras, smartphones or other 4k cameras in minutes. Filmora9 features the ability to import and edit 4K videos with ease. After launching Filmora9, create a new project by clicking New Project in the Get Started window and then go to Project Settings to change the resolution to 3840 x 2160 (16:9 4K UHD) or 4096 x 2160 (DCI 4K) based on your need. Not sure the differences between these two options, check our guide about What is 4K to get a clue. The default project setting is 1920 x 1080 (16:9 Full HD), if you didn’t set up the project settings at the beginning, Filmora9 will prompt up a window asking you to change the project settings to match the 4K video. You can click Match to Media to change the project settings quickly. Editing 4K videos requires high computer performance, to avoid your computer overrunning, Filmora9 can create proxy files to load the video in lower resolution during editing, but rending the final export video with the original full quality. You can also customize the playback quality of the 4K videos to half quality or even 1/6 quality for smoother editing. When exporting to 4K Ultra High Definition Quality, just click the Settings button in the Export window to enter the Settings window to adjust the resolution to 3840 x 2160 or 4096 x 2160. Besides, you can also change the frame rate and bit rate as well. If you are a Mac user and has iMovie 10.1 or version above, you can now edit 4K videos on your Mac with iMovie for free. iMovie is a free 4K video editing software for Mac. You can also import movies and trailers from iMovie for iPhone and iPad. With iMovie for iOS and macOS, you can enjoy your videos like never before. It’s easy to browse your clips and create Hollywood-style trailers and stunning 4K-resolution movies. You can even start editing on iPhone or iPad, then finish on your Mac. And when you’re ready to premiere your movie on all your devices, iMovie Theater rolls out the red carpet. It should be noted that 4K video editing requires a Mac from 2011 or later with at least 4GB of RAM. To play back 4K video in full resolution, you'll need an iMac with Retina display or Mac Pro connected to a 4K display. Video makers who want a very powerful, professional level video editing program are often shocked by the price tag. Then they find CyberLink PowerDirector, discover that it has virtually everything that applications with a considerably higher price tag have, and in what is considered to be an easier to use, more beginner-friendly interface. It's hard to look past PowerDirector Ultra if you need 4k support, and if you don't want to sacrifice on advanced features that allow you to create professional looking videos, even if you are a beginner or have minimal experience with video editing. This latest edition of PowerDirector supports 64 bit processors for faster editing, and of course, new support for 4K resolution videos. At under $100, CyberLink PowerDirector 12 Ultra comes amazingly close to being as advanced and capable as software that is priced multiple times more than it; making it an ideal choice for the budget conscious video editing enthusiast. One of the higher end video editing software options is the highly renowned non-linear editor (NLE) Magix Vegas Pro. Now up to version 13, this software is used by professionals and amateurs alike. Vegas Pro 13 comes with native support for 4K video, with maximum frame sizes of up to 4096 x 4096. There is native support for XAVC and XAVC S files, plus files from Red Epic and Red One. There are a number of extras and plugins included in Vegas Pro, including DVD Architect Pro. Complete support for 4K editing puts Vegas Pro at the forefront of software in this genre, while you can also edit SD, HD, 2K and 3D videos, using Sony's intuitive drag and drop interface. There are a huge number of tools and effects available, allowing complete control, creativity, and flexibility within the editing environment which is easily accessible to those who may even be brand new to editing videos in an NLE application. The software is available at a cost of $599.95; and the price is the same whether you select a download version, or the physical packaged version. At only $79.95, Studio 13 Platinum is just a fraction of the cost of Sony's fully fledged editor, Vegas Pro. Magix Movie Studio 13 Platinum is a basic video editing application, suited for the beginner and home user. With an emphasis on giving users the ability to easily create and share their videos on social media sites, or creating your own home DVDs, the workflow and interface has been designed to be as simple and intuitive as possible to use, without the extensive and more complex abilities of a high end application like Sony Vegas Pro. Notable features include a simple way of selecting the best output format with the Make Movie dialog, the choice of using the Simple Edit Mode or Advanced Edit Mode, fast direct upload to YouTube 4K, Color Match plug-in, and lots more. Another video editing application that is considered to be at the highest end is Adobe's Premier Pro. As with most of Adobe's software, Premiere Pro is now part of the Creative Cloud plan. This requires paying a monthly fee to use the application via Adobe's cloud service. The sheer number of features within Premiere Pro CC is extensive. But the latest version has been designed to provide a faster workflow during editing, which will be appreciated by both new and seasoned users alike. New features that are worth noting in the CC version include live text templates, which integrates seamlessly with After Effects, native support for a range of new formats, automatic backing up to the Cloud, improvements to masking and tracking, and the ability to export in new industry standard formats. The minimum cost to access a CC plan that includes Premiere Pro is $29.99 per month. However many users will likely be inclined to select the $49.99 per month plan which includes Premiere Pro and After Effects, as well as Photoshop and more. 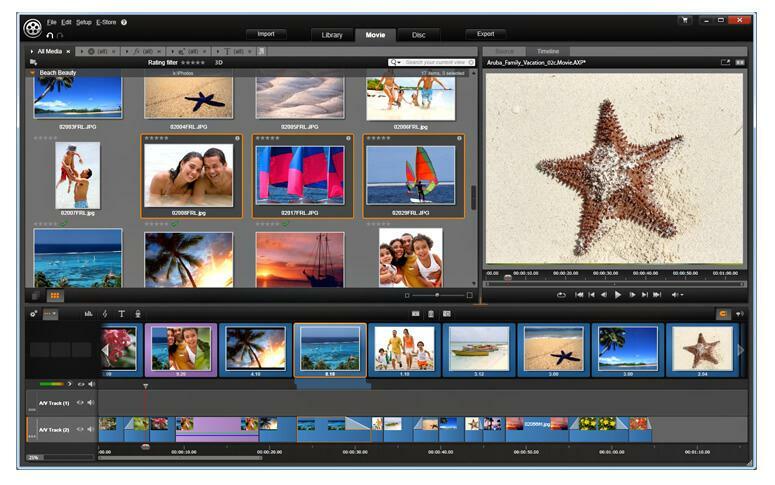 The professional level video editing application for Mac computer is the very well known Apple Final Cut Pro X. Used extensively in the professional movie industry, as well as amongst amateurs, the latest version comes with full support for full resolution 4K ProRes in multiple streams (which is made for working particularly fast on the new Mac Pro). Corel VideoStudio Pro X7 is a low cost video editing application that features 64 bit processing speed and support for 4K editing. It has a focus on a simple working environment with Corel's own FastFlick editing mode, which provides a three step method of creating videos and slideshows. Another stand out feature is the 4K Smart Rendering enhancement, which makes generating 4K videos considerably faster than in the previous version of the software. Other important features in VideoStudio Pro X7 include QuickTime alpha channels, subtitle editor, stop motion animation, multi-monitor support, and controls for time-lapse effects and variable speed control. Movie Edit Pro 2014 is another affordable video editing solution for home and amateur users that now has full support for 4K videos. This application is available in three versions: basic, Plus and Premium, with the Premium version containing the most features and capabilities. The inbuilt automatic wizards in the basic version of Movie Edit Pro make it easy for those with little or no experience in what can be the daunting process of editing videos. The software includes more than 1500 effects and templates, editing on up to 99 tracks (in the Plus and Premium versions). There is also support for multicam editing, and the ability to easily export your finished product to a range of media and social video websites. Pinnacle Studio Ultimate is an affordable video editing option for home users and those who might be just starting out. At the price of $129.95, it contains more features than the price tag might indicate. For example, 4K ultra HD and 3D editing support, more than 2000 effects, and a unique live screen capture feature which allows you to record directly from the screen to your videos (useful for presentations and the like). There is also a large royalty free music and sounds library , support for stereoscopic 3D format, and optimized output for popular mediums like Youtube, Vimeo, Facebook, DVD and Blu-ray. Of course, there are some other professional 4K video editing software such as DaVinci Resolve, we didn’t list it because DaVinci Resolve has a high system requirement, and the 4K feature is only available on the Paid version which costs $299. And if there are some other video editing software which is missed from the list, please leave a comment and let us know. But before you leave, do not forget to downlaod and try our latest video editing software Filmora9. May I ask how you export in 4K in Filmora? Can't seem to find the option. oh well, i use iMovie.